The European Space Agency has confirmed that its ice mission, Cryosat, has been lost off the Russian coast. The satellite fell into the Arctic Ocean minutes after lift-off from the Plesetsk Cosmodrome in northern Russia. The £90m (135m euro) craft was designed to monitor how the Earth's ice masses are responding to climate change. Scientists said the crash was a "tragedy" and it would be years before they could launch a similar mission, even if more funding were available. "It is a very sad event for many scientists around Europe and also for the teams involved in industry which built the satellite," said Volker Liebig, director of Earth observation programmes at Esa. Mark Drinkwater, Cryosat mission scientist, said it would be a long time before a similar mission could be mounted. "I feel extremely sorry for the teams of scientists who have staked whole careers on preparing experiments," he said. British scientist, Duncan Wingham, of University College London, UK, proposed the mission seven years ago. He said there was no other satellite in Europe or America that could do its job. "Space is a risky business, it always has been; it doesn't always go perfectly," he told the BBC News website. "We just have to think about where we go from today." Esa's member states will make a decision in December on how much money to contribute to Earth observation projects. Cryosat launched at 1902 local time (1602 BST) on Saturday, on a Rockot vehicle - a converted SS-19 intercontinental ballistic missile. 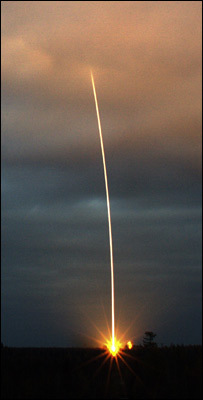 The rocket, which in the Cold War would have been armed with nuclear weapons, had been modified for peaceful space duties with the addition of a Breeze-KM upper stage. The satellite is believed to have crashed some 100km (62 miles) off the Russian coast, in an area of the Arctic Ocean known as the Lincoln Sea. Officials said it might be possible to recover fragments of debris that could provide information on what went wrong. The spacecraft was designed to provide data on the extent and thickness of the Earth's ice sheets. Previous satellite measurements, submarine and surface readings point to rapid melting in some areas, particularly in the Arctic Ocean where the extent of summer ice reached a record minimum this year. Mission scientists had gathered at Esa's European Space Research Institute, in Frascati, near Rome, to watch the launch via satellite link from Russia. They clapped and cheered as the rocket was seen clearing the launch pad, but their jubilation was short-lived. About 90 minutes after launch, when the spacecraft should have separated from the upper stage of its rocket, mission controllers failed to locate the satellite.